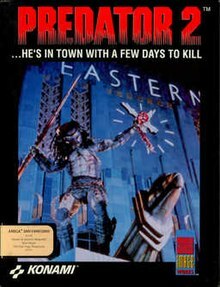 Predator 2 is a 1990 rail shooter video game developed by Oxford Mobius and Arc Developments and published by Image Works, Konami and Mirrorsoft for MS-DOS, Amiga, Amstrad CPC, Atari ST, Commodore 64, and ZX Spectrum. It is based on the film of the same title. The plot of the game follows the plot of the movie in which the player assumes the role of Lieutenant Mike Harrigan as he fights the Jamaican Posse, Colombian Cartel, and the Predator himself. Computer Gaming World opined praised the Amiga version's graphics but called the Commodore 64 version "extremely disappointing", and criticized the lack of a save game option as "extremely frustrating". In Germany, Predator was put on the "Index" by the Bundesprüfstelle für jugendgefährdende Medien (BPjM), which made it illegal to sell or make the game available to minors in Germany, as well as making it illegal to advertise the game in any form. ^ Wilson, David M. (February 1992). "The Out-of-Towner". Computer Gaming World. p. 16. Retrieved 24 November 2013. This rail shooter article is a stub. You can help Wikipedia by expanding it. This page was last edited on 6 March 2019, at 19:59 (UTC).